C# allows us to use multiple types of arrays OR Collections (will be explained in future articles), array contains multiple variables in a single location (Variables must be of the same type if array is not generic). All variables reside continuously and next to each other (By default the first array location will be configured with ID '0' and the last index will set to All items - 1). 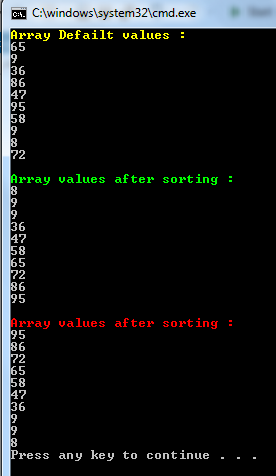 · Fixed Size - Array can be configured with specific size (max size of the array will be set on declaration and cannot be changed after creation). · Dynamic Size – The array is configured without any limitation (Will grow based on initialization). This section will demonstrate how to manipulate arrays using loops to reduce initialization and reading times. 1. User insert Minimum Number. 2. User insert Maximum number. 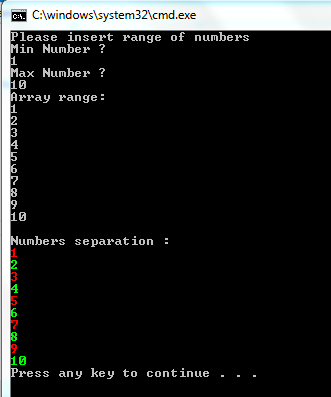 · Initializing a new array (Min-Max). 4. Calling a method that separates “even numbers” and “Odd numbers”. When moving array to function as a parameter, the array sent as the original cell in memory and not as copy, therefore every change in method body will affect the original value in memory. This part will demonstrate how to extract information from arrays using default properties and methods. 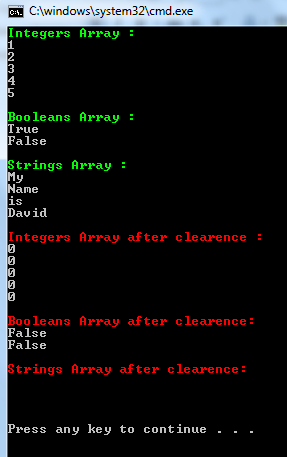 This part will examine the main methods that are existed in the ‘Array’ class. This code will demonstrate how to use the Sort and Reverse methods. This code will demonstrate how to use the ‘Clear’ method.